"A perfect place where you won't break the budget and can have everything all at one location. Alexandria & Mark were married June 21st, 2015 at Events on 6th in Tacoma, WA. The couple worked together to plan and decorate, making many fun memories in the process and ended up with a beautiful, romantic wedding day full of personal touches. That Sunday was sunny and beautiful, and the afternoon light “made the stained glass windows look absolutely gorgeous,” said Alexandria. The ceremony was set for 3 p.m., but a bridesmaid’s dress malfunction pushed it to 3:40. “We were five minutes before planning to walk, and the zipper on my sister’s dress completely broke off! She’s the maid of honor and here we are standing around,‭ ‬me trying not to faint in my corset dress, and people are literally sewing together the back of her dress!” exclaimed the bride. ‭Finally fixed, the wedding began, with Alexandria walking down the aisle to Iron and Wine’s Flightless Bird. Mark’s uncle, Pastor Alex, performed the ceremony. 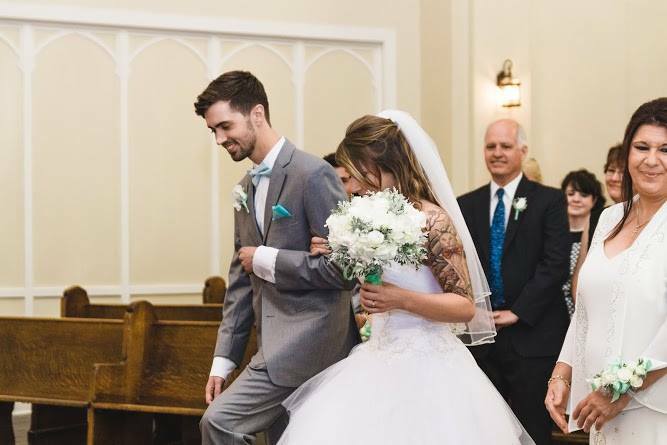 “My favorite moment was when I walked down the aisle and saw Mark smiling down at me,” said Alexandria. “He had no idea what the dress looked like!” She had bought it at David’s Bridal and Mark would refuse to even be in the same room as the bag with the dress inside. “I loved the look on his face as I came up to the altar, how he wouldn’t stop staring down at me even when everybody was praying, and how he didn’t look away,” reminisced the bride. ‭Alexandria very happy with her hair and makeup, done by BellaRicco Artistry. “‬She made me more beautiful than I thought was possible.‭ ‬I was so afraid that it would turn into something I didn’t like.‭ ‬I mean,‭ ‬it’s your wedding day and you have to look perfect‭! ‬But she went above and beyond, putting in hair extensions that looked‭ ‬100%‭ ‬Natural.‭ ‬ ‭ ‬I looked like a princess! ‭ ‬Even the small children at the wedding referred to me as the ‭ ‘‬White Princess.’‭ ‬And they would get shy when I went to say hello‭! ‬It was amazing,” she said. The couple first met when they were both‭ ‬16.‭ “Mark‬ played in a band,‭ ‬and I thought he was the coolest guy I had ever met,‭ ‬though we didn’t talk much,” said ‭Alexandria‬. ‭ “‬It took the both of us‭ four ‬years to speak to each other.‭ ‬Turns out we both had admired each other from afar but neither of us had the courage to start up the conversation! Once we finally went on a few dates, it didn’t take long to realize that something felt right,‭ ‬perfect,” said the bride. The date where it turned serious was Valentine’s Day 2014. With the plan of going ice skating and getting dinner, Mark stopped the car on a hill in Des Moines to admire the view. “He pulled out some boxed wine and electric candles and asked me to go steady with him,” said ‭Alexandria‬. Mark decided to recreate that date when he proposed to ‭Alexandria‬. Ten months and 1 day after, he tried to keep it a secret by taking her on some late-night Christmas shopping at a mall far from their home, and then, even though there was no traffic, insisted on taking the ‘back route’. “We pulled up to the same spot, and cue the candles and the terrible box wine: he proposed to me in his car looking out where we first started our relationship together,” said ‭Alexandria‬. The couple decided they only needed 6 months to plan, and quickly chose Events on 6th as their venue. “We didn’t want anything big or want people to drive from the ceremony to the reception.‭ ‬We didn’t plan on having a large wedding,‭ ‬and with Events on‭ ‬6th,‭ ‬everything was in one place.‭ ‬The bridal and groom suites were perfect,‭ ‬and the lights in the reception gave it a romantic feel‭!” said the couple. Events on 6th was decorated with a mint and white beach theme. The couple worked together to make the reception table centerpieces: mason jars with mint-colored sand and a candle inside, each a little different. “Mark and I went to Michaels to get all of the decorations to put it together.‭ ‬We had the brilliant idea of drinking while making our creations.‭ ‬It was a mess;‭ ‬we were constantly burning ourselves on the hot glue gun, and there were fake shells everywhere,” said Alexandria.‭ “‬It’s safe to say that a good handful of them didn’t make the cut the next morning when we looked over our work,” laughed the bride. The couple included a table in the lounge with photos of all their deceased loved ones who were not able to join in the celebration. “It was sweet and had a photo in the middle saying ‘In here in spirit’,” said the bride. Remble Bee Botantical Designs took care of the flowers.‭ “‬I let her take complete control and put my faith in her.‭ ‬On the wedding day I was more than impressed,‭ ‬they were absolutely perfect,” said Alexandria. The guests enjoyed food by Extra Hands Catering: three‭ ‬different kinds of salad,‭ ‬grilled veggies,‭ ‬salmon mousse,‭ and ‬BBQ sliders. “Nancy was an amazing help.‭ She‬ and the workers made all of the worrying non-existent.‭ ‬They took care of everything,‭" said Alexandria. Everyone finished off dinner with champagne cupcakes from Hello, Cupcake, who set up the stand with ribbons and decorations. ‭The couple danced to Ed Sherman’s Thinking Out Loud, a song suggested by Mark’s mother, who said it ‘spoke to her’. “Once we heard it the first time, we knew it was the one,” said the couple. The guests enjoyed dancing the evening away to a pop mix. “Your wedding day is full of memories.‭ ‬Everything goes by so fast you barely have any time to really take it all in,” said Alexandria. ‭What a wonderful day to begin their marriage!